What's the best way for entry-level convergence professionals to prove their proficiency in integrated data, voice and video technologies? Earning the Telecommunications Industry Association's (TIA) Certified in Convergent Network Technologies (CCNT) certificate, which validates the core knowledge required to sell and support convergence services. BTS Training offers A non-vendor specific technologies credential program: CCNT. This certification program is designed for telcos and other network service providers providing convergence services. The TIA Certified in Convergent Network Technologies (CCNT) program validates that an individual has the core knowledge required to sell and support convergence services. CCNT fulfills the needs of companies within the communications industry by presenting broad educational convergence training required for sales and support professionals. The CCNT certificate exam is an un-proctored, open-book program consisting of approximately 450 questions in six tests. Students who successfully complete the six-module test will receive a TIA CCNT credential certificate. The CCNT certificate program was created and optimized for competency-based training delivered in a Web environment. Competency-based training effectively combines pre-course assessment testing, study materials and post-course assessment testing. A pre-course assessment prescription gives the student a training guide that highlights areas for additional study. The CCNT certificate program was developed for sales, installation and support personnel of telcos and other network service providers providing convergence services. With the CCNT certificate, individuals demonstrate knowledge of data and telecommunications technologies, thus enhancing career potential and building confidence. It also provides an industry-valued, knowledge-based credential that is sponsored by the TIA. Basic Telecommunications explores analog and digital concepts, and introduces telecommunications fundamentals such as networks, business communications systems, signaling, Internet telephony and switching. Basic Data Communications builds a student's knowledge of related software and hardware. This module introduces the technology of network architecture, packet switching, fiber optics, data communication channels and data communication devices. Computer Telephone Integration (CTI) Essentials introduces the dynamics of connecting a computer to a telephone system for routing calls through switches. This program also teaches the technology of applications, architecture and system development. Local Area Networks (LANs) develops critical understanding of the concepts and technology of LAN topologies, information transfer, transmission techniques, media standards and network management. Broadband Technologies discusses the need for transmitting multiple signal types simultaneously by way of divided channels, and then explores the technology of voice and data integration, frame relay, SONET, ATM/cell relay, SMDS, BISDN, DSL and VPN. Voice over IP (VoIP) Essentials teaches the principles of transmitting voice calls and fax over the Internet, and explores VoIP networks, bandwidth compression, the Gateway, packet prioritization, RSVP, H.320 and H.323, and WAN engineering issues. The CCNT exam consists of six separate online tests. Each test is taken independently, allowing the learner to prepare for one test at a time. Each test section corresponds to the CCNT courseware for self-paced section testing. The learner can "test out" of sections during the pre-course assessment saving valuable time and resources. The CCNT certificate program requires the learner to become knowledgeable about all six CCNT competency areas. The training is designed to provide the knowledge required to pass each corresponding module of the CCNT exam. All six tests are un-proctored, open-book tests. 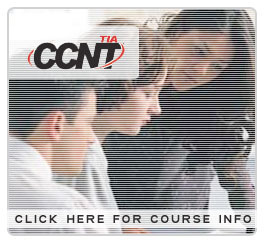 More than 5,000 individuals have already earned the TIA-sponsored CCNT credential. Earning the CCNT certificate is simple with online certificate testing. The test assessor allows each candidate up to three attempts to pass each test, section by section. The first time attempt can be used as a pre-test assessment. The results of this assessment will identify current knowledge, strengths and weaknesses, allowing learners to focus on sections of the module that need further attention. On the first attempt, students must complete the entire test before any single section may be retaken. Candidates can exit the test at any time. Upon re-accessing the test, candidates will be taken back to the exact exit point.